Join us for the first-ever Pop Tab Party! 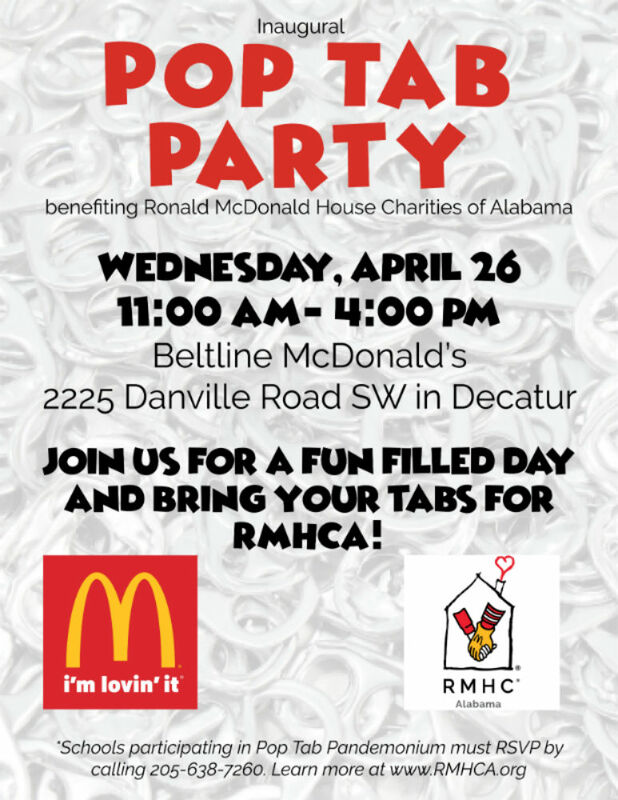 Ronald McDonald House Charities of Alabama has some big pop tab news: we will be holding the first-ever Pop Tab Party April 26 in Decatur! We are excited to be able to spend the day with our north Alabama supporters and see all the pop tabs they’ve collected. 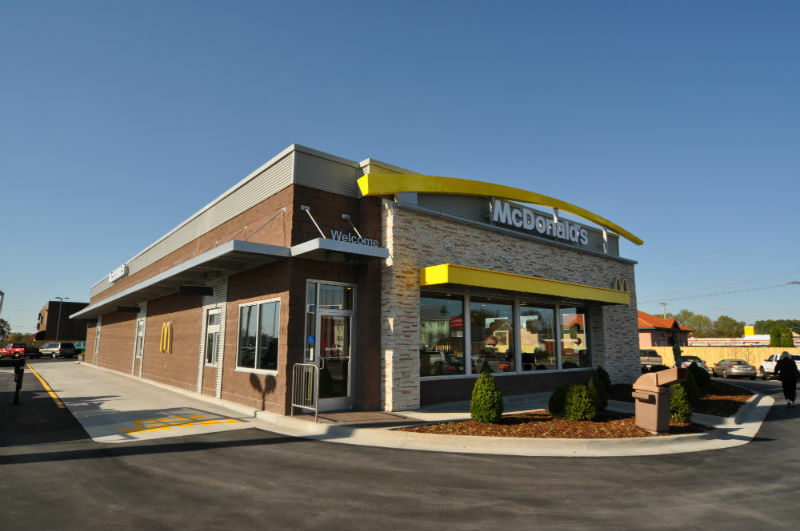 Everyone is welcome to come by the Beltline McDonald’s location and drop off their tabs, including schools participating in Pop Tab Pandemonium. Supporters can also look forward to giveaways from RMHCA, McDonald’s and 104.3 WZYP. The owner/operator of the Beltline McDonald’s, Vic Donisi, is a big supporter of Ronald McDonald House Charities. Through his business holdings in Nashville, he helped the local House and even says some of his employees stayed there. Donisi says he looks forward to building a similar relationship with RMHCA and he especially commends the many students who have spent the 2016-2017 school year gathering pop tabs for RMHCA. “It’s a special thing when your local schools are involved with a worthy cause such as the Ronald McDonald House,” he said. 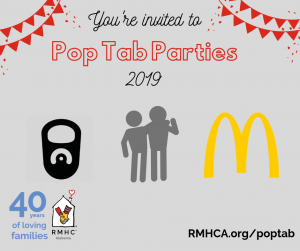 You can find all the important details below for the Pop Tab Party! When: Wednesday, April 26, 2017 from 11 a.m. to 4 p.m.
RSVP info: Schools participating in Pop Tab Pandemonium must RSVP by calling 205-638-7260. All other individuals and groups do not have to RSVP. 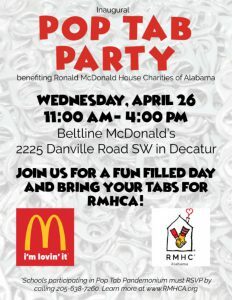 RMHCA would like to thank McDonald’s and A&S Metals of Decatur for their partnership in putting on the Pop Tab Party. The pop tab recycling program is a fun, easy way for anyone to support the mission of RMHCA. Every year, RMHCA raises approximately $17,000 from the pop tabs collected by supporters. RMHCA uses these funds to pay for things such as utility bills and supplies for guest families. Each school year, dozens of Alabama schools compete to collect the most pop tabs and win the Pop Tab Pandemonium contest. The winning school is the one that donates the largest number of pop tabs by weight per student enrolled in that school. Click here to learn more about RMHCA’s Pop Tab Recycling Program and Pop Tab Pandemonium.